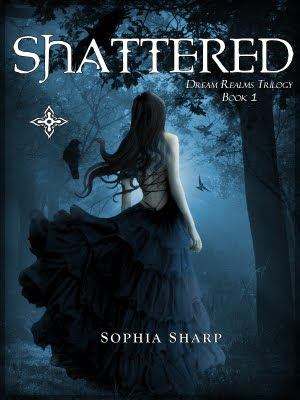 Shattered was written by Sophia Sharp. It is the first book of the Dream Realms Trilogy. But that all drastically changes when a new student arrives at Laura's school. Wild rumors swirl about his past, and Laura becomes determined to find out the truth. I have to share that as I was reading the book I was a little surprised by the editing errors. Spelling. Grammar. It was distracting. But, I liked the story and characters. I do wish there was more to the characters... and that the story and setting were more fleshed out. I kept thinking I really liked what the story could be if it was a higher quality. It wasn't until I finished the novel and already downloaded the second book in the series that I looked up Sophia Sharp. Sophia Sharp is a 19 year old college student. She wrote and edited the book by herself and then self published. At 19. While in college. Sophia Sharp has now published 4 books. And to jump ahead, I've now read 3 of the 4 books... and she has seriously improved. She pays attention to her readers comments and suggestions. She's worked to improve editing errors. She fleshed out her characters and story line so much that her trilogy ended up actually needing to be 4 books. (Book 3 ended up needing to be split into 2 "parts"). So, I would recommend this book on story idea and characters... but if you decide to read it keep in mind that it's probably not going to technically be considered good writing. It gets better. And the author is 19!!!! Color me impressed.